Ovah Coffee: Business Cards That Stick! After shopping at an Asian store near Stockholm, the boutique owner has given my boyfriend a magnetic business card. The card has been on our refrigerator door for months now. 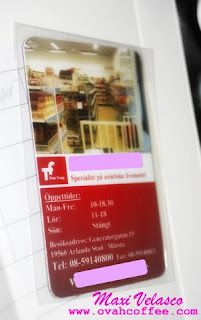 Everytime a friend asks me to recommended an Asian store, I simply proceed to the kitchen and check for the details on the business card on our fridge door. Magnetic business cards [http://www.123print.com/] actually make a lot of sense. I do have a collection of business cards in my wallet but I seldom go through them. But the magnetic business card that sticks on our refrigetor never misses to get my attention several times a day. If you are thinking of getting your own business card, I suggest that aside from ordering the classic cardboard-type cards, take some time to customize your own set of full color magnetic cards. Clients [like me and my boyfriend] find it a lot handier to stick those important business cards on refrigerators, filing cabinets and more! No more going through a pile of cards especially when in a hurry! As of the moment, our refrigerator door has a total of three [yes... only three] shopping business cards. I wonder when and where I will receive the fourth card. Until later! Maxi's signing out for awhile! Yup. You will no longer lose any of those business cards! Really handy!